Click on start > Run, a little box pops up – you can type full path of any application, folder or file in the run box and access it directly. However, typing the full path is too consuming and of boring (of course). 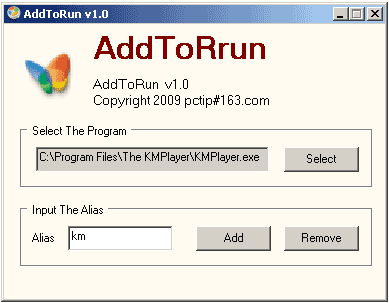 AddToRun utility makes this fun and super ease in using run box to open any application on your computer on the fly. It allows you to add nickname / aliases to any programs. For example, assign nickname km to open Km Video player. After this, goto run box, type km and hit the OK button to see Km player open. Similarly, you can assign aliases to any program by clicking select button and browsing exe file of related application in C:\Program Files folder. This cool utility does not require any installation and is fully portable. Download AddToRun, the download file in 7zip format and you will need free 7zip unzipperto extract contents. AddToRun is one handy utility to open favorite applications real quick with nicknames you can remember!